On Tuesday 11 July, Tim Bridges gave a masterly survey of the churches of Bromsgrove and district, and in the afternoon took the students to Chaddesley Corbett and Dodford. Also on the Tuesday, Julian Hunt provided a new slant on the life of A.E. Housman by using the poet’s published letters as his prime source. He was able to use Housman’s letters to his godson Gerald Jackson, which were recently acquired by Trinity College, Cambridge. The letters were read by Gregory Leadbetter, of Birmingham City University, who in the afternoon led readings of Housman’s poetry at Housman Hall. On Wednesday 12 July, Julian gave a virtual tour of the mills on the Belne Brook, including corn mills, gun-barrel mills and scythe forges. Julian was joined by Sarah Bradley of Belbroughton History Society who outlined the processes of scythe manufacture and explained the impact of the scythe trade on Belbroughton. Sarah showed a 1955 film of scythe manufacture at Nash’s Works which showed how vital was the experience and skill of Nash’s workmen. In the afternoon Sarah led a walk along the Belne Brook and students enjoyed a cup of tea at Belbroughton Village Hall. 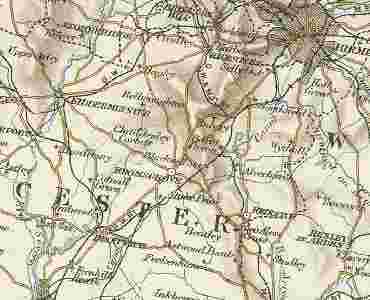 Also on Wednesday, our Chairman, Pat Tansell, showed how Bromsgrove featured in early maps of Worcestershire. Many of these maps featured in an excellent display of maps of the county loaned by Worcester Cathedral Library. Pat was joined by Richard Oliver of the University of Exeter, who explained how the Ordnance Survey transformed map-making in England. In the afternoon they visited Bromsgrove Library to examine the newly-deposited collection of Ordnance Survey maps. On Thursday, 13 July Jenny Townsend and Julian Hunt took us on a whistle-stop tour of the great houses of Bromsgrove and district, explaining when they were built and who lived in them. In the afternoon students visited Denmark House, (pictured above) the former home of button manufacturer Benjamin Sanders, and looked at other imposing houses on the Kidderminster Road. Also on Thursday, Pat Tansell gave a much appreciated review of ‘Bromsgrove on the Eve of War: Our Town and District in 1939’. Pat presented newspaper accounts of evacuees arriving at Bromsgrove and rarely seen archive material showing how Bromsgrove and district prepared for war in 1939. In the afternoon, Pat’s group joined the walk along Kidderminster Road, where she was able to read out the names of residents given in the 1939 Register, an emergency census carried out by the government in September 1939. Plans are already under way for next year’s Summer School. Courses are planned on Catshill: an industrial village, Bromsgrove in the 20th century, Lord Austin and Lord Nuffield (giants of the British motor industry), Bromsgrove and Stourbridge (contrasting North Worcestershire towns), and the local needle industry.